It was a 100-mile round trip by the time I collected and brought home the childsitter, but it was well worth it. Last night (Thursday July 20) Posie and I traveled across the Hudson to the Bard College Campus in Annandale, and its unique summerstage – a Spiegeltent. 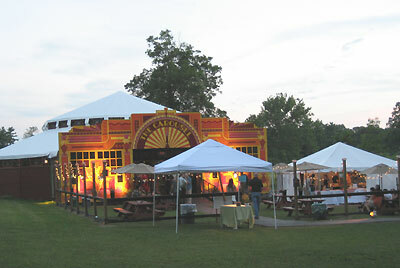 The SpiegelTent and outdoor dining/bar area: not your average festival tent. The Spiegeltent at Bard features no less than 1700 mirrors (no, that’s not a typo); the family business in Brussels that built it also traveled to New York to erect it. Without doubt, it’s the most beautiful and fascinating outdoor venue I’ve been to in many a year. Bard has clearly tried to make the most of it. As part of its wider summer performance series, the SpiegelPalais has been featuring outdoor dining in the early evenings, cabaret and concerts in the mid-evenings (DJ Spooky and Carl Hancock Rux have already performed there this summer), and a local DJ late at night. 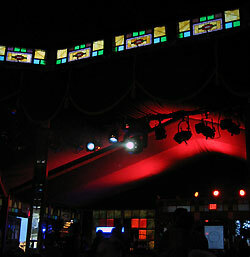 The stained glass windows up top and down below render the interior of the SpiegelTent a work of art. We attended for the mid-evening concert. Two people I know well from separate circles – Ben Neill, and singer Mimi Goese – were performing together as part of Neill’s XIX concept, a series of mostly instrumental pieces influenced by 19th Century classical romanticism. 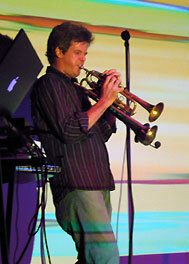 Ben Neill is one of the few musicians able to cross effortlessly between avant-garde, electronica and jazz, and that’s partly down to his secret weapon: he’s the inventor and sole performer of the mutantrumpet, an adapted brass instrument that allows him to send MIDI signals via breath and touch, thereby engaging sequences, backing tracks and effects, without putting hand on a keyboard or computer. (An Apple does hum quietly alongside him, but the music is entirely human, driven by instinct and feel; sequences are extended or shortened on a whim and a nod just as in any jazz band.) He’s recorded for labels as diverse as Verve, Astralwerks and Six Degrees, and worked with all manner of left-field musicians, old school and new. At the Spiegelpalais he started off his set by leading Rickenbacker-toting bassist John Conte and drummer Jim Mussen through a series of chill pieces that more easily qualified as trip-hop than 19th Century romanticism. (Apparently, he sampled simple notes and phrases from music of that era, but by the time it’s refiltered through his trumpet and myriad effects, you wouldn’t know it.) It was perfect music for a mid-summer evening, but as I’ve found before with Neill, it needed that special something to take it to the next level. 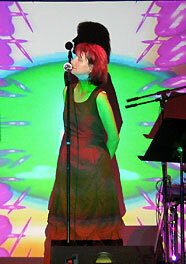 Ben Neill and Mimi Goese: briding avant-garde, electronica, jazz and pop. Throughout, Neill’s long-time partner, Bill Jones, created digital video imagery in real time, further elongating a that ran the gamut from classical to jazz, avant-garde to electronica, and trip-hop to pop. It was an absolute joy. 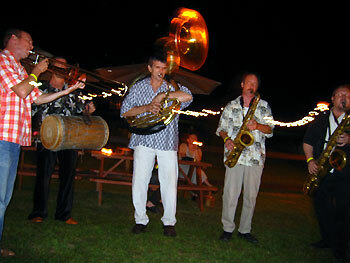 The moment the set finished, the resident Spiegelband (think “alternative Oompah”) began performing out in the garden, while staff removed the tables from the middle of the tent to create a late-night dance floor. Bard, it should be noted, is in the middle of nowhere, and the concert was not desperately well-attended. I therefore figured the DJ set would be a bust – but we noticed a couple of dozen younger people (younger than us, at any rate, and without child-sitters on an hourly rate to worry about) filtering in to enjoy dance music in the beautiful countryside. Sadly, we had to leave before the DJ kicked in. Equally sadly, as designated driver with so many miles ahead of me, I also didn’t get to enjoy the SpiegelPalais’ drinks, which exclusively featured two of my favorite companies: Millbrook Wines, and Magic Hat beers. My one sip of the Tocai Fruilani that Posie ordered confirmed for me that Millbrook was smart to import and plant this Italian grape in the Hudson Valley. I know people who drink this wine by the case, and I don’t blame them. Oompah, oompah, stick it up your jumper. The SpiegelPalais wraps up already next weekend. Between now and then, you can take advantage of early evening dining, various cabaret and drag shows, the late night DJ, and a weekend afternoon musical performance of a Hans Christian Andersen story. Of course, you have to live within driving distance – and that, as you can tell, is an elastic concept round these parts – but if you do, then as I said up top: it’s a journey worth making.